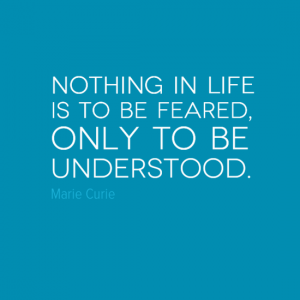 Legendary scientist Marie Curie suggests that nothing in life is to be feared – only to be understood. Marie Curie was born in Poland in 1867, the fifth and youngest child in her family. When she was 10 her mother died of tuberculosis and she was sent to boarding school. Following her graduation from school she struggled to enrol at a higher education institutions because she was a woman. Despite this early set back she went on to become the first woman to win a Nobel Prize, the only woman to win in two fields, and the only person to win in multiple sciences. She was also the first woman to become a professor at the University of Paris. In 1891, Curie left Poland for France and began studying at the University of Paris and was awarded a degree in Physics. 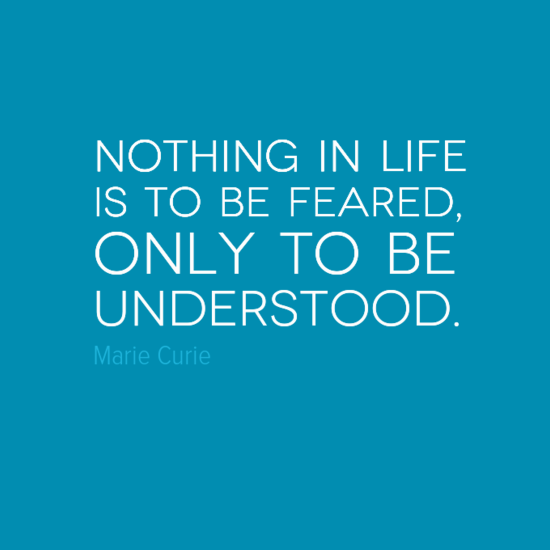 In 1903, she was awarded the Nobel Prize in Physics and in 1911 she was awarded the Nobel Prize in Chemistry. Curie died in 1934. Her death was believed to have been caused by her long-term exposure to radiation. In 1995, Curie became the first woman to be entombed on her own merits in the Panthéon in Paris – a mausoleum containing the remains of distinguished French citizens.